What have you learned in NS2? I’ve been working on this tune for several weeks and finally got to the stage of my workflow where I start automating stuff. Usually, I just do minor tweaks to the mix and whatnot as I go, but I don’t do any parameter automation or volume/pan stuff until the very last thing. One reason is a bit of a limitation in NS2 where I can’t move automation on tracks, but because of that it’s offerred me a new creative outlet. This allows me to shape the sounds i’m shoving into the plugin with automation control and it’s made this drum and bass sounds very nasty IMO, but only when I want it to be, because this is on a send, so I can automate the volume of how much trashy distortion I want mixed in (which for me is a lot because distortion is ). Anybody else learning neat things as they are working on stuff? Love this! Instead of crying about what’s not there you figured out a way to get your desired result. There’s a very deep lesson there! It’s called being “creative”! Here too, full immersion - I'm amazed continually by the exactitude and particularity of nanostudio for sound, for bringing it all together, for the evolving of the ideas of the music itself. Like a beatnik given the perfect typewriter, I'm now contemplating, extracting, removing and rearranging with an unheard-of appreciation. +1 for pointing out the positives of creativity. Nicely done @drez!! For me biggest thing i learned was ironically in area which i never used too much in my tracks - sampling. As a result of some complains about missing features i was on the hunt for workarounds - and i found some pretty cool ways how to use sampling inside NS which pretty much expanded my creative arsenal .. For example automation of sample start, eventually mixed with quantisation in automation editor is veeeery powerfull .. Or in combination with Slate (triggering obsidian) to get basically non-destructive sample slicing. What a posibilities ! And i'm sure i still didn't explored everything what is possible. Oh hey, I just learned that you can edit part properties for all selected parts at once. This means naming parts is super simple. I was almost sure it wouldn’t work because it’s one of those workflow optimizations that always gets bumped by something more important. But it’s Matt, so it’s just there. In v 1.0. Learning by listening to (all of) you, thanks for your insights. Setting up tracks with fx like in Will's prj. https://www.dropbox.com/s/8lnany5ttxc03y9/That dot below the moons.nsa?dl=0 and automating the sends (Drez!) make Matt's wishmashine move, for sure! So I’ve been working on automation on this song and I’d like to recommend that you take the time to actually do automation. I mean reeeeeaaaaallly automate stuff. At this stage of the song I’m structurally done...the song is basically 90% written. But as I start automating effects, filters, ramps, etc, it starts to change the song where I didn’t know it would go. It’s tedious, no doubt, but when you HP filter one part it opens up space for another and you’re like oh man this other part needs to get featured right here! also, the mix starts to get way better because you are consciously thinking about creating space for things or creating a musical effect with the automations...bringing the delay up, or cutting all the sends for an in your face dry effect. The possibilities are endless, but you don’t get their until you really start hacking away at it. Also, I always save off the version of my song to archive right before I start automation in case it goes somewhere....bad then I can just start again. Based on my experience, the ONLY time you will need a backup is when you DON’T have one! ... and i found some pretty cool ways how to use sampling inside NS which pretty much expanded my creative arsenal .. For example automation of sample start, eventually mixed with quantisation in automation editor is veeeery powerfull .. Or in combination with Slate (triggering obsidian) to get basically non-destructive sample slicing. What a posibilities ! And i'm sure i still didn't explored everything what is possible. @dendy I’ve played with automating Obsidian’s sample start but would love to hear more details about your trick triggering Obsidain with Slate to do slicing. Sounds really slick, but I don’t quite follow how this works. Are you sending midi from Slate to Obsidian and then modulating Sample Start (Source) by Note (Dest)? Me too. I also tend to treat the automations as their own parts, on separate tracks, so they can be muted, moved, repeated etc etc independently of the notes. That can make A/B comparison a lot easier too. @drez was talking more about track automations not pattern automations.. track automations cannot be moved (at least not in some simple way) cause they are not connečted with parts on tracks - so if you decide rearrange parts in sequencer, you then need change underlying track automations manually. Just need to qualify this a bit: track automations are easy to move, duplicate and change, they work with the same type of drag handles as part automation, but independently of parts. Been off my iPad for a spell but lost an hour earlier today messing around with modulating the FM oscillators again. Along with the envelopes internal to the FM oscillator, there's just so much to play with. This ! Most powerful part of Obsidian. I’ve learned that with an iPad, some dedicating migrating from desktop, some time to adapt and respect the platform, and NS2, it can be done, with regard to beat making, Anything. If not directly as of yet, then with a workaround of some sort. NS2’s stability and simply getting out of the way to let me create with an ease is something I’ve never experienced in the digital space. I’ve learned that instead of settling for static 4-8 bar loops I should make transitions and changes (other than hook, verse etc) that are surprising at 25-50-75 bars etc. I’ve learned to balance a life that once cost me personal relationships because it required me spending 12-16 hour days in studio. Now I can ‘sneak’ a beat in no matter the environment, place, or time. I’ve learned how to tame a multilayer synthesizer (obsidian) and create sound kits, inspired drum kits and become a creator (sound designer? ), for creators (producers) for creators (recording artists) for consumers, instead of just a creator (producer) for creators (recording artists) for consumers. It’s also encouraged me to slap built in plugins on things just out of curiosity because it’s so simple and stress free to try. I no longer have to worry about crash risks associated with experimenting on iPad. it’s also encouraged me to ‘draw in’ hi hats and note repeat drums which has made me ‘think’ instead of ‘feel’ (maybe, or vice versa) about how something should sound, which actually leads to better feelings about my beat after a night of sleep. Initially I was like others, mentally citing all the things iPad, NS2 etc couldn’t do, but since realigning my mind absent expectations based on prior experiences, I just accepted the platform as is and tried working thru it and since that point, it’s been great. Overall NS2 has opened up a new way of thinking, not just to myself about myself but for the community as a whole. I respect great work, so I want to see incredible creations from such and incredible creation. I think this software should be more celebrated and I hope that once the ‘gaps of lack’ are closed that naysayers will see the light. No software on any platform has ever felt so inviting and made me feel so capable. Plus whenever I stalled out, members of this community helped me get back on track. So I’ve learned that it ‘takes a village’, takes love, and takes dedication. I’ve also learned to get some thicker skin. Blip has spent years putting this masterpiece together and I and others had immediately sought to state what it can’t do or what it doesn’t have, showing little to no regard for what was sacrificed for its creation. Meanwhile, I’ve been shy to showcase a beat that was ‘different’ to my peers that took no more than a week to complete (usually an hour). I can’t speculate on if it has been worth it for @blipinteractive simply because I don’t know what it’s cost him/her/them vs what they’ve recouped (financially or otherwise) but I know for me it’s literally changed my life, in so many ways, if for no other reason then allowing me to be adaptable (out of the studio space) during times that require it, for the life changes I’ve experienced recently. Wow, thanks for sharing that @iPadBeatMaking , this echoes a lot of my experience with both Nanostudios (and life changes) and was simply a beautiful read. Blip Interactive is Matt Borstel, he’s the single-minded madman behind Nanostudio. 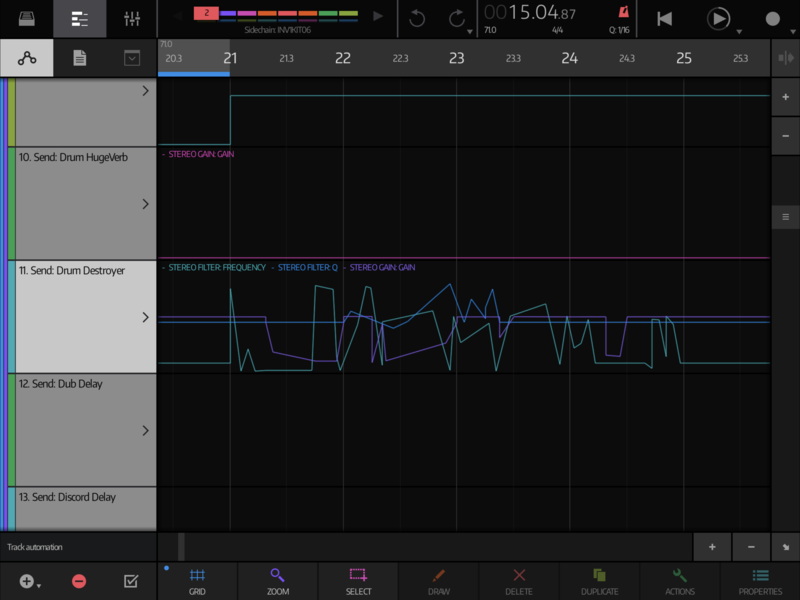 @iPadBeatMaking lovely post .. same like you and @Stiksi , it pretty much defines also my NS1/2 history .. This will be for sure heartwarming reading also for Matt ! @iPadBeatMaking Fantastic post!!! I share your hope that NS2 gets more credit and praise in the future. As is NS2 does what it does really well, and the anticipated upgrades will make this even more true.